The State Habitat Meeting, hosted by Pheasants Forever, Quail Forever and Nebraska Game and Parks Commission is an annual event, open to the public. The weekend started off with a Friday night social, with the main event following on Saturday, February 9th at the Holiday Inn Convention Center in Kearney, NE. Past participants may have noticed a few changes this year. Covey Corner offered a new and unique room for youth and young adults, complete with an inflatable archery and BB gun ranges. Additional activities such as, make your own bee box, seed butterflies, coloring sheets and more were available to provided activities for all ages. Just down the hall was a new addition for adults, the Wine and Craft Room. Participants had the chance to paint with The Rustic Patch, while also sampling local wine from Mac’s Creek Winery & Vineyards. 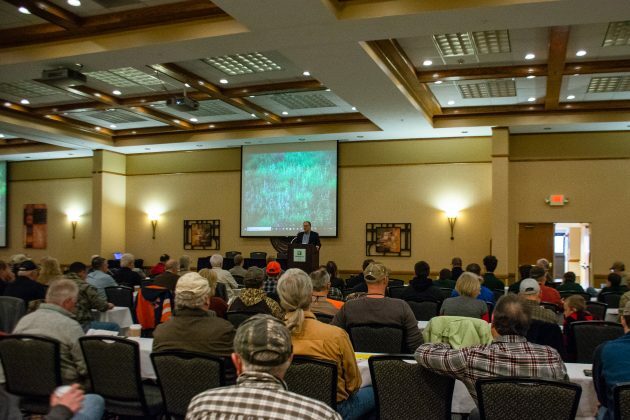 Many guest speakers were in attendance from around the Midwest, and topics included everything from cover crops, precision agriculture, habitat management, and saline wetlands to education and outreach opportunities, dog training, R3, monarch butterflies, and more. A break in activities midday led to the first ever Upland Slam Grand Prize Drawing, including an overview of the program with submission highlights. A Saturday night banquet concluded the weekend, hosted by the local Prairie Hills Pheasants Forever Chapter. The date for the 29th annual State Habitat Meeting has been set, so mark your calendars for February 1st, 2020 in Kearney, NE. We hope to see you there! Pheasants Forever and Quail Forever are dedicated to the conservation of pheasants, quail and other wildlife through habitat improvements, public awareness, education and land management policies and programs.